That’s what friends are for: I presented three workshops during this conference, and Linda Apple, the Queen of Public Speaking and my very dear friend, was there by my side to encourage, introduce, pass out goodies, critique — whatever I needed help with. All this without my asking. Okay, I did ask for the critique and as usual, she gave me lots of helpful advice. Also, though this was Steve’s first major writing conference, he was there for every workshop, making copies as needed, “googling” for information on request, and general moral support. His help with a variety of things–critique, lugging heavy stuff around, running out to buy needed supplies–was invaluable. NOTE: If you attended one of my workshops and didn’t get a handout, please use the contact form below, and I’ll be happy to send one to you. Just let me know which workshop you attended! It’s fun to have fun. I think one of the best things about this year’s conference was the costume party, where attendees were invited to dress as their favorite characters or authors. We had great participation and some wonderful costumes. I can’t tell you the last time I went to a costume party, and though it might have been a little vain to call Sachiko Kimura of The Red Kimono my favorite character, that’s who I dressed as. 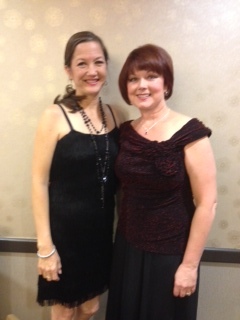 And though I’m 50 years older than Sachi was in The Red Kimono, I had the fun of a child that night. A minor snafu with the trophies meant Tony didn’t have one to present to me. But you know what? It didn’t matter. Heather Davis graciously lent me her Best Non-Fiction Book trophy for pictures. But best of all, as we scrambled around, figuring out what to do about no trophy, many people stopped me to congratulate me, and told me they loved my book. Each one of those praises was like a little trophy, and with each comment, I thought, “You don’t even know me, and you read my book? And you liked it?” I mean, I know my family and friends read The Red Kimono, and of course, they’re going to tell me they liked it. But to have people I don’t know come up to me to pay a compliment about my book is priceless. And though Tony assures me I’ll get my trophy, I can be sustained by the kind words I heard that night. Grace under pressure, Part Deux: Almost anyone who has to fulfill a big responsibility in public feels a lot of pressure to get it done right. Tony LoPresti and Jim Martin were in charge of the contests this year. To say there were over 900 entries that had to be distributed to dozens of category chairs and judges via either snail mail or electronic mail is only part of the responsibility. Don’t forget about all the names they have to pronounce in front of a crowd of hundreds. So, when the big night arrived with a few minor problems, it could have been a catastrophe. Me? I think my voice would have started quivering, my knees shaking behind the podium. But Tony? He was a pro, and kept the audience entertained with his quick wit. I told him he’s a natural and should become a comedian. Thanks, Tony, for a fun night. I already look forward to seeing you next year! 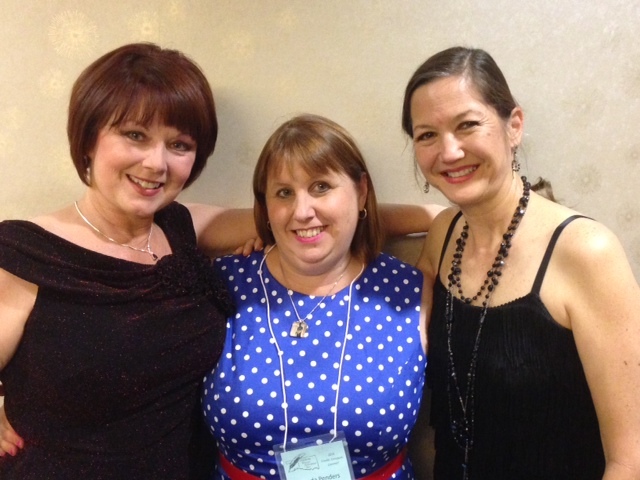 LInda Apple, Rhonda Pender of The Wild Rose Press and me! This entry was posted in Uncategorized and tagged CD Jarmola, Christine Jarmola, Heather Davis, Jan Morrill, Linda Apple, OWFI, The Red Kimono, Theresa Hupp, Tony LoPresti. Bookmark the permalink. 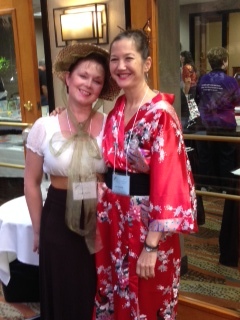 The Red Kimono won the Best Fiction Book Award at this year’s Oklahoma Writers Federation Conference! 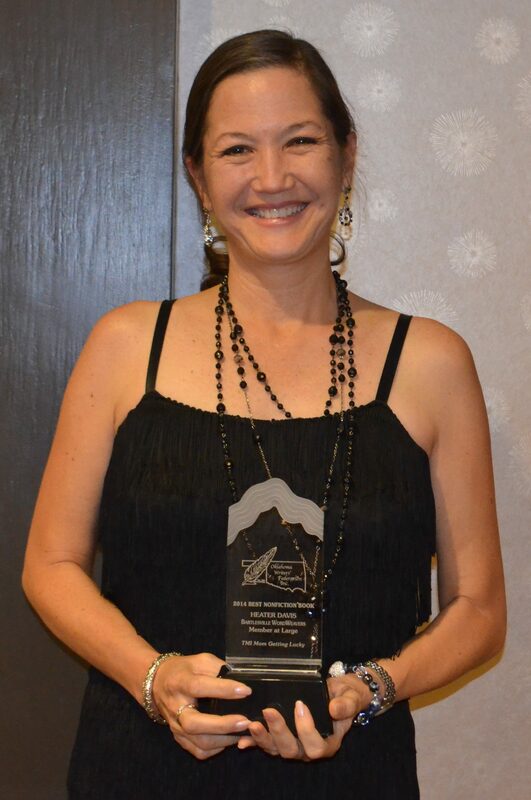 Congratulations Jan. The book and the author well deserved this award. See you next time you’re in town. Thank you, Velda. I owe a lot of getting this book published to you! Hope to see you soon. You are a natural Jan! I loved your sessions. 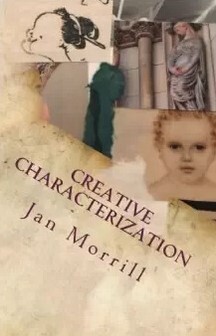 I learn something new each time I hear your presentations on character development and breaking out of writer’s block. Your new presentation on Historical Fiction session was so interesting. I recommend all of your to anyone who needs a speaker!